From the bestselling Triton range is our 6.1+ model, brimming with features in a stylish stainless steel design it is sure to make a focal point of any garden space. The unique ‘Redi Tank’ system holds a gas bottle/cylinder securely, connecting to the digital thermometer it measures the bottle weight over time, so you’ll always be ready for a gas refill. A useful tool holder, storage cabinet and two spacious drawers offer enough space to hold all your barbecue equipment in one place. The cooking grills are made from enamelled cast iron and measure an impressive 80cm x 44cm including a griddle/hot plate, easily catering for up to 14 people. 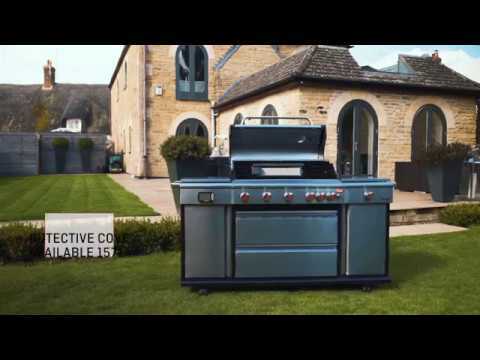 For those who love to barbecue, the Triton 6.1+ includes a side burner and infrared back burner where there is space for an optional rotisserie to be purchased and placed, recommended model – 13050 rotisserie. The 6.1+ Triton model includes Landmanns PTS+ system (Precision Temperature System) combining all the benefits of PTS, ensuring even heat distribution, and features Easy Clean design for reduced fat residue.